Have you ever tried store bought veggie patties before? For me, what a disappointment. It was overly salty, mushy with no texture whatsoever. I think it’s always a good idea making a big batch of your own veggie patties and freeze them in individual bags. Because when you are in hurry, unfortunately you tend to grab a bag of processed looking-healthy-but-not-so-healthy foods. 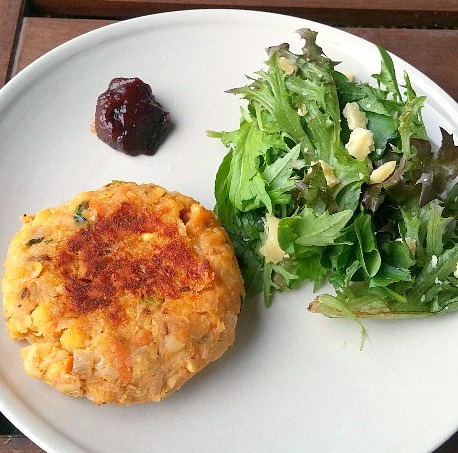 This veggie patty is a mixture of grains, nuts and veggies. Yes, it’s a perfect wholefood full of flavour and texture. Soy sauce and mushroom for unami and earthy flavour, tahini and chickpeas for creaminess and nuttiness, herbs and spices for extra-nutritional boost. Oh, another plus side is that it’s an affordable budget meal. Yay! You can serve this as main (like what I did in the photo, served with green salad and a little dollop of Korean chili sauce called Gochugang) or in a bun or wrap. Coat a frying pan with a drizzle of coconut oil and cook chopped onion and mushroom, grated carrot and crushed garlic for 3-5 minutes until cooked. Add this mixture with the rest of ingredients into a food processor and pulse until well combined (but not overdone). Add a bit more rice flour if the mixture is too wet. Adjust seasoning with salt and pepper. Make little patties with clean hands. You can cook in a pan for 3-5 minutes each side until golden or freeze the patties in individual sandwich bags. Slice off most of the green tops. Halve the leek bottoms and run under cold water to remove any grit. Steam the leeks until just soft and then set aside. Brush with coconut oil and grill them over medium heat until you get nice grill marks on each side. Meanwhile, cook the French lentils until soft. For harissa dressing, mix harissa, olives, caramelised onion, olive oil, a squeeze of lemon, salt and pepper in a mixing bowl. 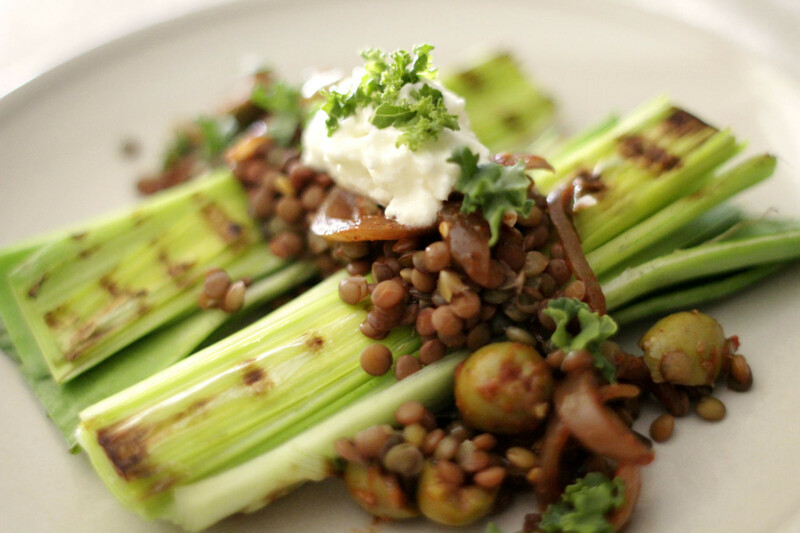 Arrange grilled leeks on a serving plate. 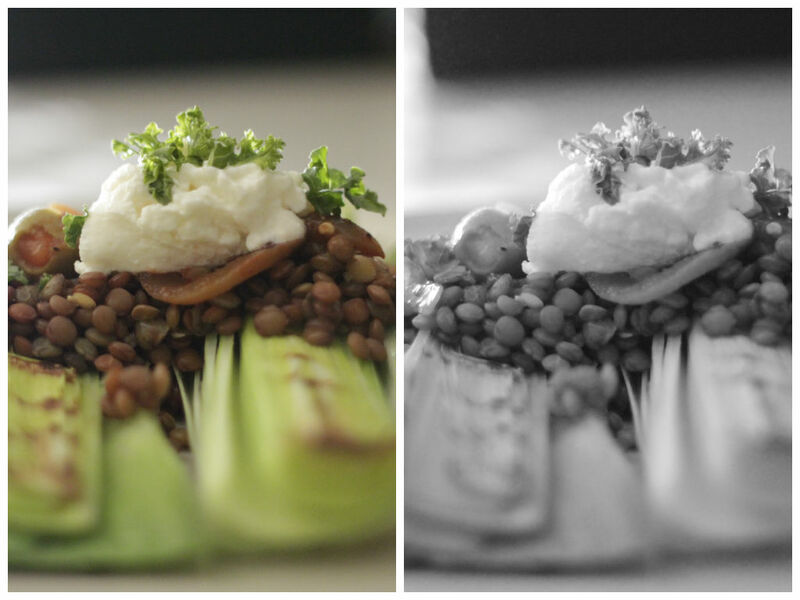 Spoon cooked lentils and harissa dressing over the leeks. Garnish wish cottage cheese and parsley on top. Want to boost calcium and magnesium in your diet? Here is a great vegetarian source for strong healthy bones. First of all, yummy nutty sweet gluten-free grains yet inexpensive and easy to prepare. It is millet! If you haven’t heard of it or seen it, you can find them in health food shops or markets or online. It looks like couscous or quinoa. It is an ancient seed originally from African and Northern China. Why is it good for us? It is naturally gluten-free, non-allergenic, easy on digestion and alkylising your body. Millet is also rich in iron, B vitamins (Niacin to lower your cholesterol), magnesium (helps with migraine and heart disease), calcium, serotonin (great for your mood), fibre (helps with constipation) and protein (great for a vegetarian diet). So how do you use this awesome guys? You can add to your salad, make patties, use grounded millet in baking healthy muffins, serve stir-fry or protein with it, make stuffing or make a bowl of creamy porridge. It is so versatile! Sesame seeds are also loaded with calcium and magnesium. Eating a teaspoon of sesame seeds a day can help provide 28% (based on a 2,000 calories diet) of the calcium needed daily. I like lightly toasting them just before use to maximise nutty fragrance and flavour. Mix honey, olive oil and soy sauce and marinade salmon for half an hour. Then pan fry for 3-4 minutes each side over medium heat. Set aside. For the millet, soak 100g of millet in water for 6-8 hours or overnight. Drain and rinse off to remove the phytic acid. Heat coconut oil in a pot over medium heat. Add finely chopped onion, corn and millet. Stir for about 5 minutes until onion is fragrant and translucent and millet is well coated with coconut oil. Then add water or vegetable stock to cover millet, put a lid and cook for about 10-15 minutes in low heat until water is all absorbed. 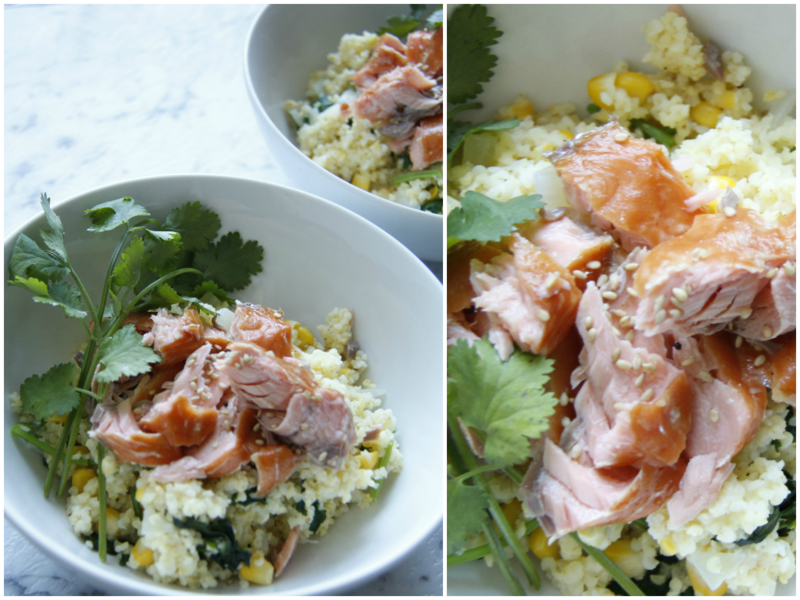 You can add more water depending on how you want your millet to be cooked (fluffy or moist). Stir occasionally. Turn off the heat, season and stir in roughly chopped coriander. Taste and adjust seasoning. Let it sit with a lid on for a few minutes before serve. 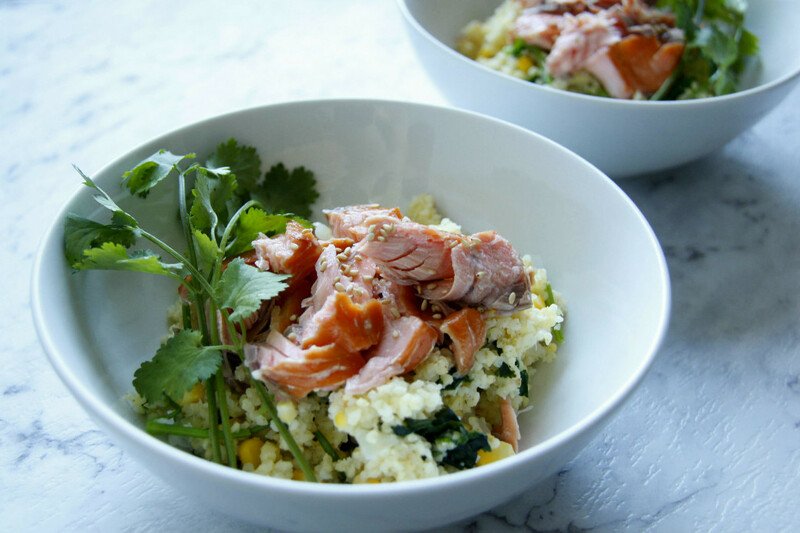 Serve flaked salmon on warm millet. Garnish with fresh coriander and sprinkle toasted sesame seeds. Aside from being one of the quickest legumes to prepare and the easiest of all beans to digest, mung beans have numerous positive health benefits. They are a good source of essential fatty acids, antioxidants, minerals, and protein. Green mung bean is known as the dosha balancing food according to Ayurveda, it cleanses the gut if taken regularly. It has significant amount of soluble fiber that helps cleanse and heal the body at multiple levels. Soak mung beans overnight. Rinse and cover with water in a pot. Bring it up to a boil and simmer for 20-30 minutes or until cooked. Drain and set a side. Heat coconut oil in a pan and add chopped onion and spices. Saute for 5 minutes until soft and fragrant. 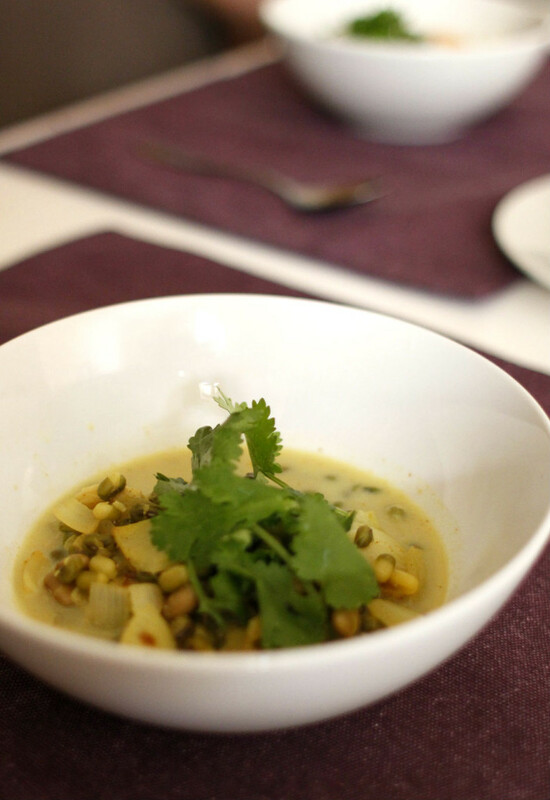 Add cooked mung beans and stir in coconut milk. Simmer for another 5 minutes. Take it off the heat and transfer to a serving bowl. Serve warm over rice or with bread. I bought a bottle of basil infused oil a while ago from the shop. A scent from using the oil when cooking is just amazing! Store-bought infused oils can cost you fortune. So I decided to make my own using dried chillies and cloves of pickled garlic. 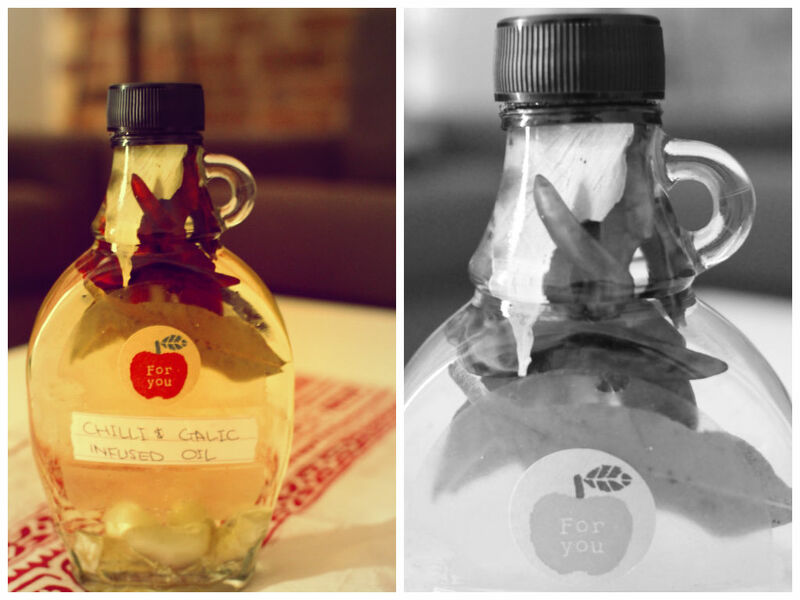 You can make infused vinegar, honey, oils with dried or fresh herbs. As a chilli and garlic lover, I’m going for this chilli and garlic infused oil, but feel free to try with rosemary, pepper, lemon, thyme, basil, etc. I used a handful of whole birds-eye chillies (very hot!) and a few pickled garlic cloves that I made before. Warm the light olive oil and ingredients in a sauté pan and warm over medium heat for a couple of minutes (not boiling!). Let the oil cool completely and transfer to a sterilised jar. You can leave the ingredients in the bottle or strain before using. Allow to infuse for a week in the fridge.